Wallpaper Manager from MSN Canada. Thread: Wallpaper Manager from MSN Canada. Check out this great new Wallpaper Manager from MSN Canada. There is a small download (477KB) installer file, which then goes on to install the program and also download the wallpapers. The installer will ask you if you want to make live search as default, make MSN your homepage. Take your decision and un-check/check options if you have to. For your information the Wallpaper changer also adds itself to the start-ups list. You can edit, flip, add graphic elements or text, change settings, insert foreground images, create a slideshow of images and do a lot of things with it. Quite a nice app, actually ! Thanks James. 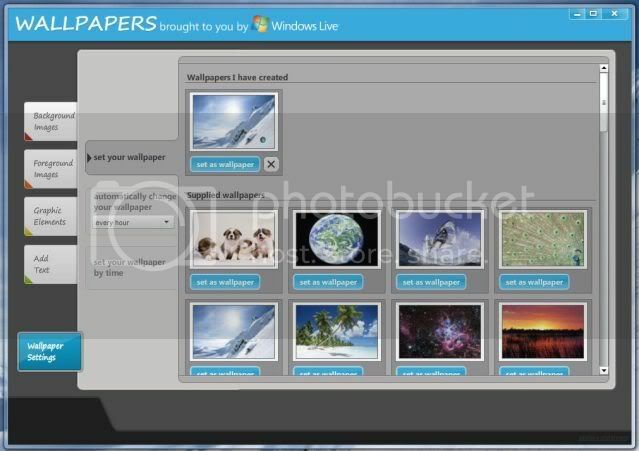 Hey, I'm gonna share a pice of news regarding Wallpaper Manager from Windows Live Canada. Did you know that a newer version of such software is out? Indeed, a MSN Wallpapers program offered by MSN UK is a newer version of Wallpaper Manager. It has a nice purple, better-designed interface and can be downloaded for free. Go here to download it for FREE! How did I know that this program, although it looks very similar to the Windows Live Wallpaper Manager from MSN Canada and does not have a version number listed anywhere, is the newest? I already had this program installed when I followed the advice of WinVistaClub and downloaded the installer from MSN Canada website. When it started to set up, an error message appeared saying that a newer version of the software has been already present in the system. this is cool utility available at msn, good way to manage all the wallpapers easily, i think MS Office Picture manager also do the same job? ?